There are different types of care provisions that a country offers to its citizens as well as for foreigners and immigrants. With this, care providers and agencies promote their businesses and organizations by advertising their capabilities along with their licenses and certificate forms that indicate their reliable business. However, these organizations must assure that their legal forms and documents are up to date, which is why they must undergo a registration process followed by a specific procedure which introduces the group to the state for attaining a legal business permit. One of the common forms that these organizations must complete is known as care provider intake form. What is a Care Provider Intake Form? 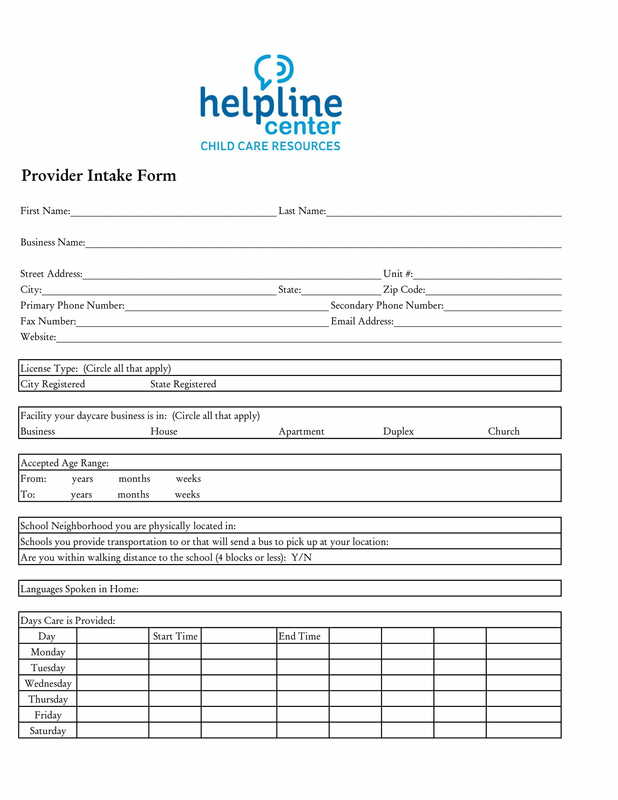 Basically, a care provider intake form is used for updating the information of a care providing agency or organization. The form will require the organization’s representative to disclose the general information and significant details of the group which includes their business data and target clients. Once completed, the form must then be submitted to the authorized officer of the government who collects the details and change or remove any entry from the previous data that the organization provided. Additionally, this form can also be used as an instrument that aids survey processes wherein the objective is to statistically determine how the population of a state needed the services of an organization, as well as distinguish the price relevance of the services that clients commonly request within a specific period of a year. You may also see counseling intake forms. 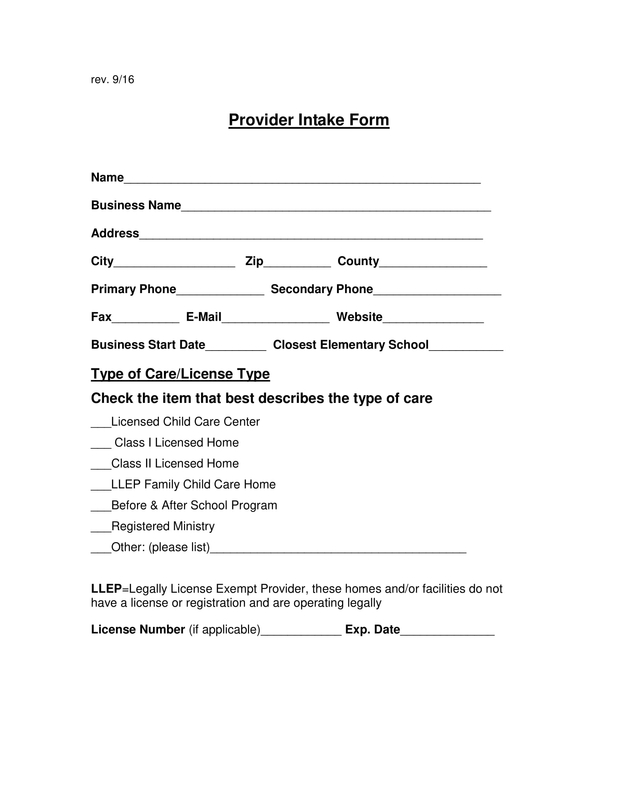 What’s the Content of a Child Care Provider Intake Form? 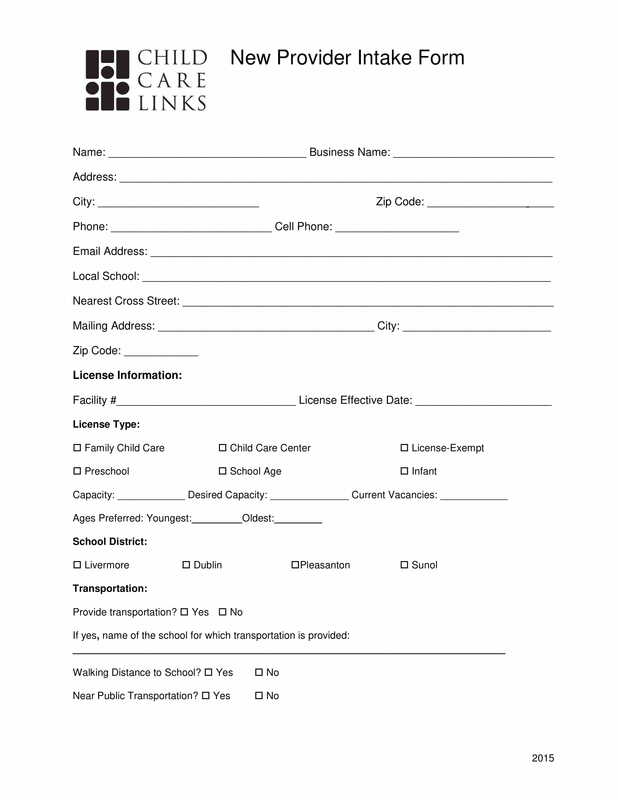 Child care provider intake forms are used to acquire an introduction to a child care provider or agency. The form must have the name of the business or care provider along with their business address and contact information in the first section. The second area of the form focuses on the licenses that the business currently has for the city and the state. The third and the succeeding sections focus on gathering the details of the childcare provider, including the languages that they practice in their organization, and the daycare schedules that they allow their clients to choose from. An intake questionnaire is also enlisted on the form, which will allow the provider to disclose further details regarding their policies, allowances, and training methods that they mandate for their employees or members. Aside from a child care provider intake form, there are also other forms under this category that can be considered to be used by the state such as dental care provider intake forms for dentists and social care provider intake forms for social welfare workers and volunteers. 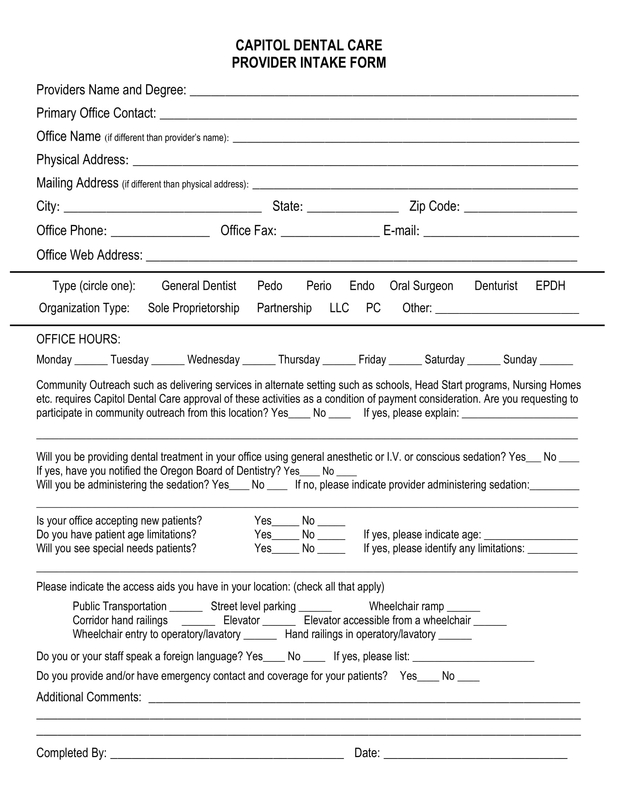 You may also see new patient intake forms. How to Create a Simple Care Provider Intake Form? 1. Name the form and have a section for the basic information of the business. The name of the form must be incorporated into the topmost area of the document which will then be followed by the service provider’s general details. These details must cater the full name of the business or organization, business contact numbers, and office address, as well as the business’s start date and license number. You may also see client intake forms. 2. Add checklist boxes for the varying certificate forms and licenses associated with the business. This is where the user of the form will be able to disclose the types of certifications that the organization or business have along with the dates of the certificate or the license’s expiration. Additionally, a line can be indicated at the bottom of a checklist which contains ten or lesser number of items in order to lessen the space that is allocated for this area. 3. Indicate a section for the capacity information, age range, and language preference of the business organization. The capacity refers to the limitations of the license and the availability of the services, the age range will determine the average ages of the clients who often visit the organization, while the language preference implies the types of languages that the staff in the premises are able to speak and comprehend. Details about the transportation that the care service provider uses for meeting their clients can also be included in this section. 4. Include a table for the organization’s schedule and price rates. The schedule to be filled in the form must be accompanied with a start and end time data per day that the organization is able to provide their services. On the other hand, the price rates table must be able to distinguish the average payments that each age category or group gives for hourly, weekly, and daily service requests. You may also see family intake forms. 5. Incorporate an environmental and risk assessment checklist. The purpose of having this section is to determine what facilities are available at the premises of the organization and the hazards or risks that can be evident in the area. This serves as an initial security check for the group in order for them to ensure the safety of their clients and members. 6. Add checklists for discounts and policies. This will highlight the specific policies and house rules that the organization mandates for their clients and members along with the types of discounts that they allow for persons with disabilities, students, and other individuals who deserve minimal price rates. You may also see therapy intake forms. 7. Add a thank-you note. A simple thank-you note at the end of the form can be stated, which will imply the acknowledgment and the gratitude addressed to the user. You may also see sample assessment intake forms. Who Uses Care Provider Intake Forms? The target users of care provider intake forms are the varying professionals who want to work as care providers in a state such as physicians and organization member volunteers. These users must be able to complete all the fields of the form for them to acquire a validation of their claims and for them to be accepted as part of an agency. Since there is various care providing services that deal with the lives of the population, some states and countries demand high credentials and license certificates from their care provider applicants before any of them will be considered for an obligation or duty. You may also see massage intake forms.